Being a complete beauty addict and self confessed beauty hoarder, finding ways of storing my makeup is a constant battle. Every time I think I've got enough storage, along comes another couple of lipsticks and I've ran out of room yet again. I'm well aware that there are a million and one 'makeup storage' type videos on YouTube and pretty much every blogger, myself included, has the IKEA Alex Draw Unit and Muji drawers...however, this can get a little expensive and as a recent graduate, I just don't have the money (or the space) to be forking out for these kinds of storage systems. I do have the IKEA Alex Drawers, and a Glamourcube (clear acrylic cube/drawers) and I'm well aware that you all know what these look like, so today I wanted to focus on some more affordable makeup storage ideas and little DIY pieces which you can add to your storage. I picked up this little makeup organiser around 6 months ago now in my local TK Maxx for around £7 (complete bargain!) so it's always worth checking in your local store just incase they have any cute makeup storage boxes/draws - I know my local store always has a couple of options. However when I was browsing my local Home Bargains the other day, I saw this exact unit in store for a mere £4, making it accessible for anyone's budget. I like to store some of my most used foundations and primers in here, along with my lipsticks and a couple of lip glosses in the back as they're easy to reach for touch ups throughout the day. Whenever I reach the end of a candle, I always wash out the jar and make sure I keep it, just incase I need any extra storage. For months before getting my little IKEA pots, I always stored my makeup brushes in old Yankee Candle jars and it worked perfectly well. At the moment I'm storing my beauty sponges inside a Primark candle jar as I really had no idea how to store them/where to keep them. The original candle cost me £2 and now I have a perfectly good glass jar to store sponges in, making these ultra purse friendly. Inside my IKEA Alex draws I like to divide up my makeup into sections so that it's easy to find and a little neater than just shoving everything inside. I have a mixture of boxes inside my draws, half of them are acrylic draw dividers from Muji and the other half are just old Birchboxes that I've managed to collect over the months. I do love the Muji draw dividers as they're plain and simple, however they aren't very deep so for products like foundations, primers and powders, they're not great. This is where the old Birchboxes come in. They're the perfect size to fit inside my Alex Draws and I've managed to store up to 12 foundations in one box, making them really practical for makeup hoarders like myself. Much like the candle jars, it seems silly to just throw them away when they could be recycled into something useful! 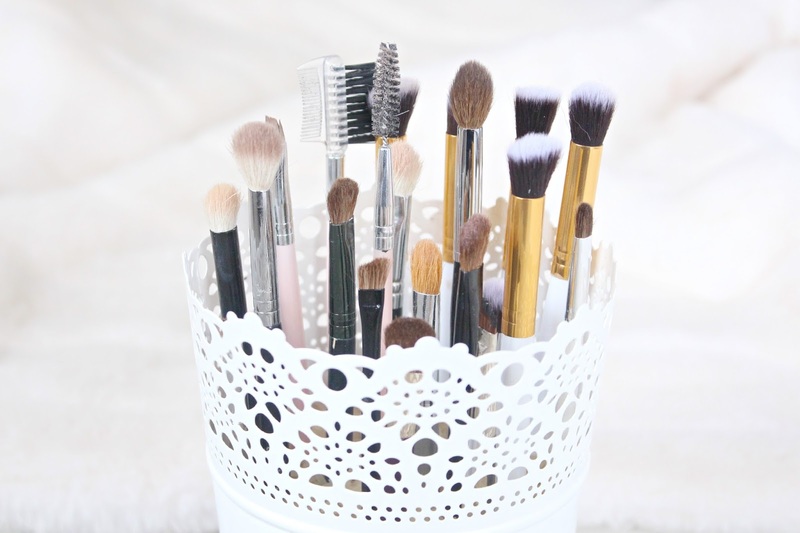 I store my brushes in these flower pots from IKEA which I'm sure you've all seen before, however what I wanted to talk to you about was how I make my brushes stand up so they're easy to see and grab in the mornings when I'm doing my makeup. I only do this for my eye brushes, as my face brushes manage to stand up in their own, however I find that when I just leave my eye brushes on their own they all mix together as they're so thin, making the smaller brushes hard to find. I saw on YouTube that a lot of bloggers were using little glass beads to make their brushes stand up, however as these were a little bit trickier to find and more expensive I decided to use rice. My brush holders aren't clear so it doesn't matter what they look like, and rice can just be thrown away when it gets too dusty/unhygienic and it doesn't cost the earth. It may seem like a weird suggestion, but it really does work if you want your brushes to stand up like mine. I love the rice tip! Definitely giving this a try! Never would have thought of the candle holder idea! I really want some nice decent storage solution for my Alex unit! It's so hard to find something that fits perfectly. I love seeing other people storage and it makes me want acrylic storage and I've been slowly buying them. I also found that flower pot dupe since there isn't an ikea where I live. I'm moving this weekend and am looking to re-do my makeup storage. I've loved finding household items to organize beauty products, like file organizers for makeup palettes, cookie trays for lipsticks, and mason jars for brushes! I have a 24 tiered lipstick holder and love it. Just the right amount.